I'm very proud of my son and his siblings, and the entire church congregation, and wanted to share this. Below is an image of the sign made and the article I. submitted to the church newsletter. This project was carried out throughout the month of December and was an incredible learning experience. The Sunday School Class of St. John's Church decided (as a Christmas gift) to ask the congregation to donate money to buy goats through Episcopal Relief and Development. The goats provide milk and cheese that can be eaten or sold by the poor families in third world countries. 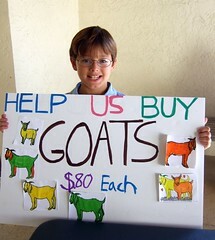 The Sunday School Class made a sign and colored goats on it. I made announcements at the 7:00 am, 9:00 am, and 11:00 am Sunday services to tell people what we were doing. Last year we raised $547.05. This year the total sum of money raised was $2,243.46!!! We ended up with 25 goats, a pig, bees and a beehive, a fruit tree, and two drought resistant seed trays. Great work! Thank you for your support of Episcopal Relief and Development!